Currently (October 2014) on a trip to Andalusia for research. This is usually when I find my favourite places as I have time to investigate properly. This just has to be one of THE places to visit in Europe. I discovered it very late in my travelling career (only 2014) but am back for a second time this very year as I fell in love with the town and the region on my first visit (hopefully more news on that to follow in a soon-to-be blog). 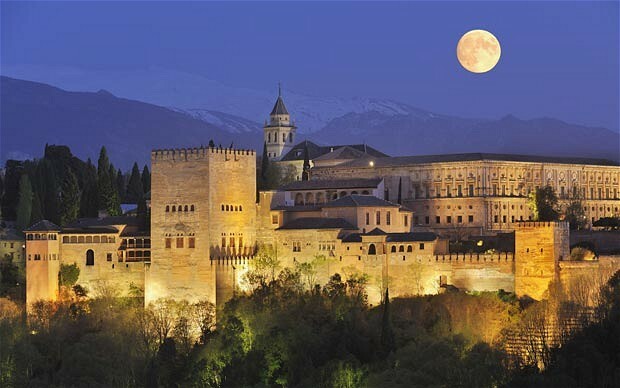 The towering Alhambra Palace, which hovers above Granada; a majestic ever-present reminder of the glorious past of this incredible place, is worth the visit alone. However the real magic starts to happen as you lose yourself in the small streets and take the time to relax – there is nothing here to stress over. In February I was fortunate enough to be a guest to Granada, invited by the Andalusian tourism board. One day I skipped the organised lunch in order to sniff out future hotels. I came across (thanks to a good friend) the Casa del Capital Nazari and what a find. It’s sort of three hotels in one (today I’m staying in an apartment in that section) and each part is stunning. The location is perfect and the staff super attentive. It might be just a tad more than I normally spend when travelling alone, but sometimes you have to treat yourself and this is one such occasion. Not surprisingly they fill up, so book here early. Low season is Jan and Feb as well as the summer when there are amazing deals (but it will be hot). Great, great hotel. I decided to include a massage (very reasonably priced and extremely well executed). You can buy bathers there if you don’t have your own. The place is not crowded as they are very good a limiting the numbers, but to me nighttime was simply perfect! Have a look at their website here; Arab Baths of Granada. Meson el Trillo – Callejon del Aljibe de Trillo 3, Albayzin. Well the first challenge is to find it. Made it? Then you can just relax and enjoy – delicious food (I especially like the Spanish version of nero di seppia). Both inside, tables set with all sorts of non-matching cutlery (a favourite of mine) and outside – a shady, cut off garden, are nice for eating. The wine is limited – in terms of your choices – but maybe that’s as they have just gone for what’s good? This is a place where I like to indulge and have dessert as well. There seems to be a website (I’ve also come across two or three different versions of it’s name), but I can’t always get it to work (try link here), but you DO certainly need to book, so maybe ring 958225182. The staff were nice (I love that they call you ‘mi amor’ as they take your order) and it’s a great place to sit and people watch. I think there’s wifi too, but who needs it in a place like this. 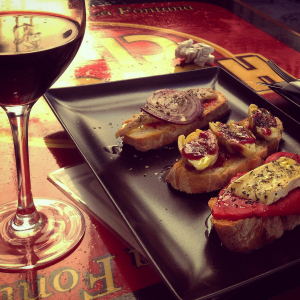 Don’t think there’s a website, but there IS great wine and tapas… Just go. By the way – the BEST espresso I have had in ages! 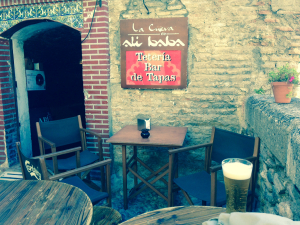 La Cueva de Ali Baba – Santa Ana (Just past Iglesia de Santa Ana, South of the bridge over the River Darro, Granada) Once again proof that often all it takes to get off the beaten path is about 30 paces. In this case just cross the river to the ‘Cave of Ali Baba’. In the afternoon it’s a great shady places with views on the goings on below from the terrace. In the evening there is a really a grotto-like feeling to the interior. The prices of both beer and wine are very reasonable and the bar staff of course (otherwise it wouldn’t be on here) friendly. I don’t think there’s a website, but you don’t need one. As you wonder down the hill after your Alhambra visit, stop for a refresher. Hi Thomas. 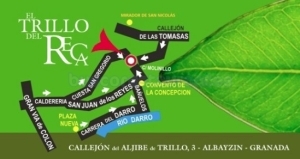 We are going to be in Andalucia mid October. I hope you might be around so we can see you!